good review. have you considered doing “Roller Blade” its about these nuns from a post apocalyptic future. you’ve probably already heard of it. I do intend on doing it at some point. Although I don’t personally recommend it because it deviates so much from the books, I’m thinking you should check out the Sci-Fi Channel movie, Deathlands. And then read the books, if you don’t already. Mutant-filled post-apocalyptic joy. I have the movie but I haven’t watched it yet. I know they veer way off from the source material. Yeah, baby, that’s what I’m talking about. 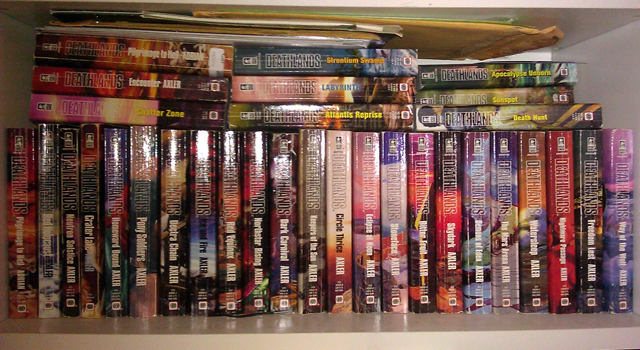 Sadly these days I’m quite a few books behind on Deathlands. But at least these days there are more options open to me than used book store hopping to find missing volumes. The movie is okay, Vincent Spano makes a pretty good Ryan Cawdor, they made Jak a mutant with bouts of uncontrollable rage(what??) and cut out Doc(my personal favorite) entirely. I’m curious and I’ll get to it at some point. Plus, I love Traci Lords which is the main reason I even have the thing. I just know it is a huge departure from the books.